I went looking for combat boots for a photoshoot that Abi and I were styling. We weren’t looking for anything fancy or expensive but everywhere I went, they didn’t have them. The day of the shoot I headed over to H&M in Emeryville which of course, didn’t have them. I walked by Steve Madden and I swear I did like three double takes and walked by 3 times, debating on whether or not I should go in. I figured those shoes would be too expensive for the shoot but I walked in and found some boots for $40. DOPE! But of course…the sales clerk tells me there’s a sale going on. Buy one get the second half off. UGH. I was already going to keep the boots for myself after the shoot so why not buy another pair I wanted? I already knew which ones I wanted and luckily those were on sale too! 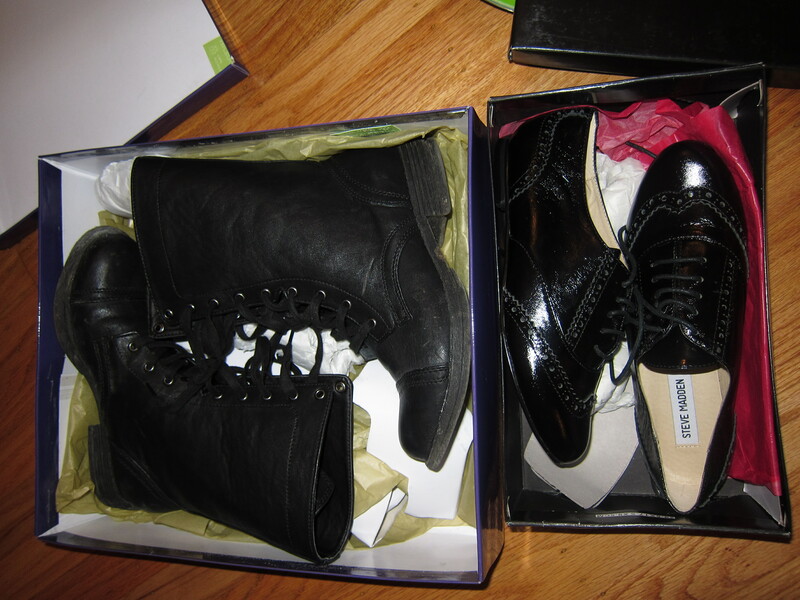 So I got a pair of Oxford shoes and boots for about $70!. After that I headed to Claire’s to get some cheap hoop earrings for the shoot. I was trying to decide which ones to get when the lady tells me if I buy them both I can pick a third pair for free…WTF. FINE. THESE DAMN SALES GET ME EVERY TIME! !